This trip had been the best trip of my life…. Starting Journey: 14th Aug, 2014. We had planned to meet near Majestic Bus stand by 11PM. By the time we reached there, our organizers (Deepathy and Channa) were already there waiting for few other people and Tempo Traveler. We had a small introduction session before our journey, which helped as Ice Breaker, as we were standing in separate groups and not interacting with anybody at all. After much waiting, Tempo Traveler arrived and we started with our journey, which was very smooth throughout. They stopped at couple of places for tea/coffee, but being in so deep sleep, I hardly realized. We reached Chikmagalur around 6 AM, weather was awesome. They had booked a big room in a beautiful homestay. We all slept for another hour and then woke up freshened up, and had tea/coffee. 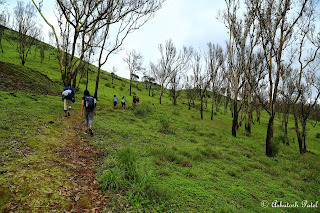 Soon after tea everybody got ready with their bags to start their day with Trek to Mullayangiri. We had Breakfast in homestay and started from there to our Trek starting point in TT. 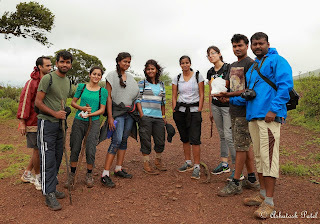 We completed our trek in two hours and reached the peak, within few steps I could feel the difference and freshness. Breeze was cool, it was all misty, and it was all so beautiful. This Trek was worth this view and this feel. 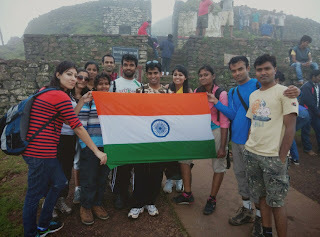 There was a temple on top, we all went inside, as it was 15th Aug, Channa had brought our National Flag with him. We captured few beautiful group pix inside the temple. After spending some time inside the temple, enjoying the view and weather, we started descending from Mullayangiri peak. There were stairs on the way back. It was all misty, it was all so fresh.. True Rejuvenation, this is what you call it. In such an awesome weather, we got Bhajji and Tea/Coffee. We all enjoyed it, relaxed a bit there. And then again started from there. It was around 1PM, we stopped for Lunch, which we had brought as parcel from homestay. We all had Lemon and Curd Rice. After having lunch, we started in TT again and went to the second spot as per the plan – Jerry Falls. There was a trek of around 1 KM to Jerry Falls from the point where our TT dropped us. We started, as the trail was muddy, there, the major terror amongst all were Leeches. The very first attack happened on Channa, but he noticed it immediately and got rid of it. We reached near Jerry, guys in our group, decided to take a shower under the falls. Girls were still thinking, but then decided to go under the falls and enjoy. I must say, it was worth going there. We all played in Water, we got massage therapy by standing under the falls, and we were shouting with excitement, water was cold. Spent some time together and then got out of the falls. With wet clothes, we started our trek back to the TT, it had started raining as well. The plan was to trek to Dattapeeta, but because of bad weather, trek was not possible, so there was change in plans, and we went there in TT. Bababudangiri is known for its shrine to the Sufi Saint Baba Budan, a pilgrimage site for both Hindus and Muslims. There were stairs to the shrine, it was like a cave, very small though. The moment we came out, it started raining. We waited for a while there, but started while it was still drizzling. Again, we got into TT and started for our next trek. 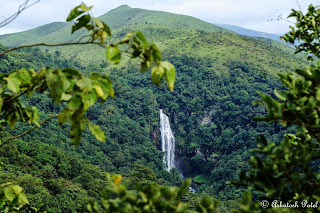 Manikyadharas falls is on the Baba Budangiri hills. We all started from the point to the falls, it wasn't very far, there were around 100 steps to reach the falls. It was small as compared to Jerry, but beautiful. Those who had not gotten into Jerry falls, they stepped into water, had a few pix and then we started from there back to our TT. Once we reached to our TT, we were feeling very hungry, there was just one Tea shop, they were giving Omelet-Bun, we ordered a few, had tea. In that weather, that omelet-bun and tea, tasted the best. Rain had stopped by then. And there it appeared in Sky – The Rainbow. Ahhh!! What a view.. Everybody went crazy after seeing the rainbow, have never seen such a clear rainbow, it was actually a complete VIBGYOR. After having some fun there, we again got into TT and started from there back to our homestay. We reached, we freshened up, came down, tea was ready for us. Enjoyed tea, and asked homestay people to get us bonfire ready. Until the bonfire was ready, we all were sitting in the food court of homestay and were discussing and finalizing the plan for next day. We played for a very long time, sipped soft drinks, which we had taken on our way back. After some time, dinner was served, we had dinner and after such a long day everybody was ready to crash. Few left early for bed. We few, stayed near bonfire, to keep ourselves warm and a little more chit-chat. Second day, we had planned to leave early. So we got up, got ready and as planned, we had our breakfast in homestay. We started from there with our backpacks, as our stay there was over, and started for the adventures of new day..
Trek to Z point was a narrow one. It was around 2 Km of trek. There was a beautiful waterfall on the way to Z-point, Shanti Falls. A muddy trail was there, till the waterfalls, and again fear of leeched, so we took some salt along with us. Path was really narrow, and we were walking very carefully, but it was a bit easier than the previous day trek to Mullayangiri. It took approximately 45mins to 1 hour to reach Z-point. The moment we reached there, we felt very strong wind. We were tired and it was around Lunch time, we had few biscuits and water, relaxed for a while and enjoyed the view in silence. And after some time, we started back from Z-point. Kallathigiri falls are just 10 km from Kemmangundi. Water cascades down from the top of Chandra Drona hill from a height of 122 meters amidst fascinating scenery. There is an old Veerabhadra temple dedicated to Lord Shiva, constructed in a gap between rocks. This temple can be approached after crossing the waterfall. There were pujaris doin pooja and giving Prasad to people. We crossed the waterfall, water was chilling. We saw the temple, and immediately came out as there were lot many people waiting to get inside the temple. Hebbe falls it was an unexpected last minute plan as we did trek for the first day very less because of weather circumstance second day we planned for this place. 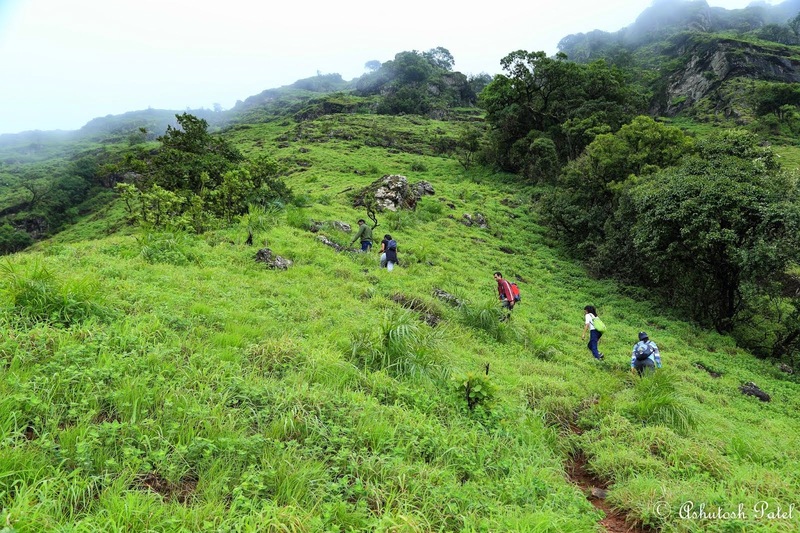 We reached near kemmanugundi and we got permission to trek to hebbe falls from forest department. If anyone planning to trek to hebbe falls be there before 11AM because after that trekking is not allowed but still there is jeep facility that who cannot do a trek. 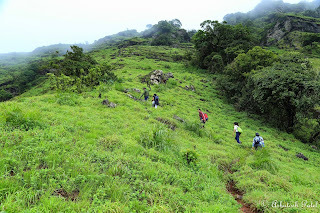 Our trek started at 11AM exactly and Channa instructed before only this will be deadly trekking spot if anyone can trek approx 20Km continuously those people can join us, so there was 10 people ready for trek. We started getting inside the forest. 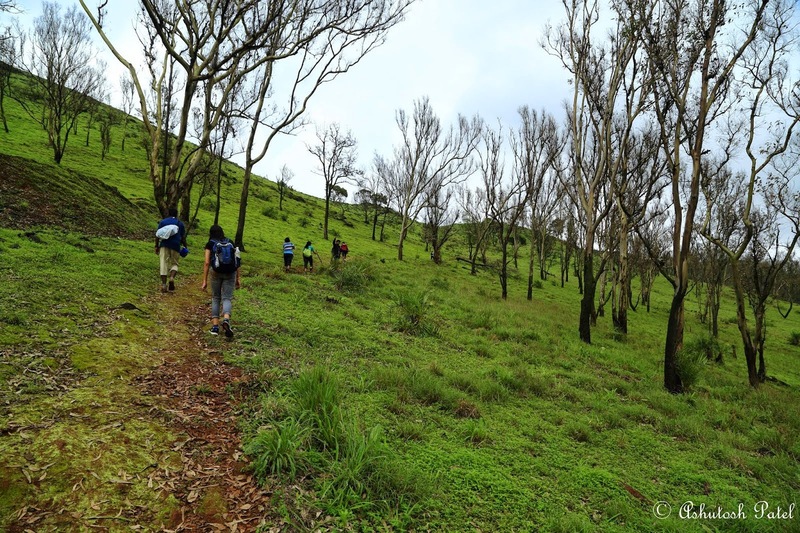 From kemmanugundi to and fro around 20km.Our journey began with lots of enthusiasm, beauty of the nature was calling us with open arms. 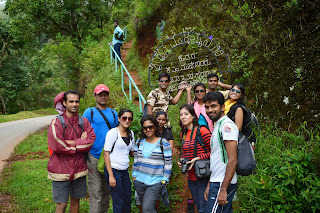 And it's very adventurous place to trek and challenging part was we should come back from there by 4'o clock evening. 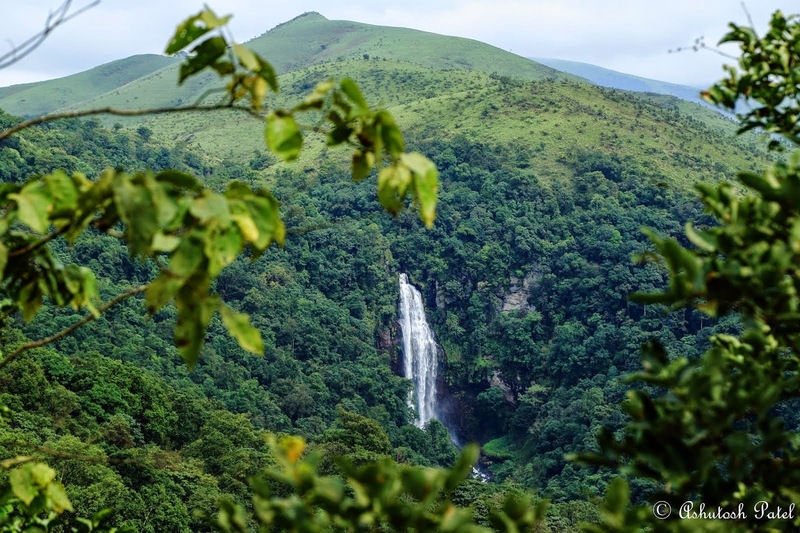 Hebbe falls is a beauty of hidden paradise and has provided us with wonderful gifts. It is filled with adventurous spots, scenic landscapes, colorful flora, splendid waterfalls, exotic locales, snow capped peaks, lofty mountain ranges, picturesque dense lush green forests and its true heaven in the earth for people who really love nature. And on the way there was four to five water stream we suppose cross in dense forest .And it was completely fun filled journey to reach our destiny And forest was completely filled with coffee plantation ,orange trees. Within 1 hour 20 min I guess if im not wrong ,we reached our destiny ,there was happiness in every one face the moment when we got to see the hebbe falls The waterfall that is 168 metres in altitude. Like other spring falls in the region, the water stream is believed to cure skin disorders. Enriched with minerals, the water stream is also a source of drinking water in the region. On striking a rock, the waterfall diverges into two separate water streams. Among these diverging streams, the smaller one is known as Chikka Hebbe, whereas, the bigger one is known as Dodda Hebbe. We played in water for quite long time then water flow power increased then decided to leave place from there. We got some orange to boost our energy and we had orange with salt which we had taken to protect our self from leech. And many people had brought chocolates, biscuits, nuts, puffed rice masala …… and thanks for each and every one who shared. We had taken break in between forest had all this stuff to fill our stomach. And again there was leeches, didn't leave us. Trek won't end up without leeches in hebbe falls. Whole team was very supportive to each and every one and this is again one of my most memorable trek that I cannot forget in my entire life. Tones of thanks for the BTC, Channa, Deepthy for well organized event. I hope at the end of the trek everyone back to their way with full of memories.